@ iTunes, Spotify, Google Play, Amazon ati be be lo. 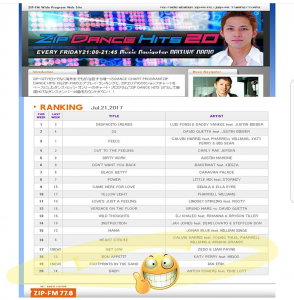 Ian ';s song, ";Footprints In The Sand”; has remained in Top 20 at Japanese dance radio all summer long since it debuted in June and this week has risen to #3! Look for the mashup of Ian Erix and David Guetta also hitting the airwaves in Japan this week! Comments ti wa ni pipade. Erix afikun 17 ọjọ to UK tour! ©; 2019 Lan Erix: Osise Aye. Gbogbo awọn ẹtọ wa ni ipamọ.